Basic patterns drawn with pen in Hole No. 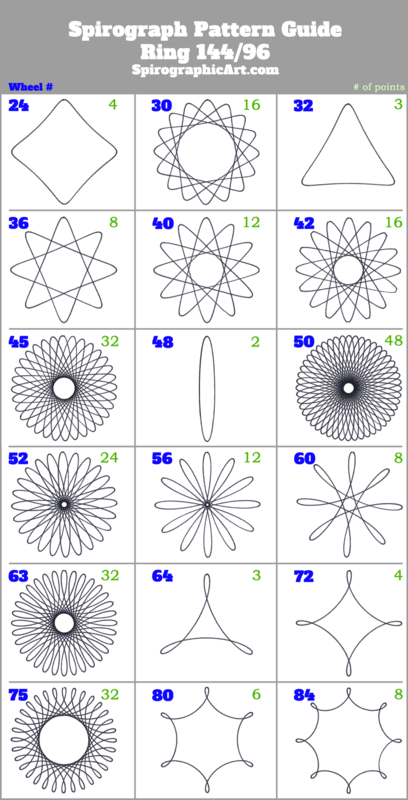 1 in each of the 18 round Wheels in the original Spirograph and Super Spirograph. Note that some versions, the ones with the shaped wheels, including the new Spirograph Deluxe Set by Kahootz Toys, do not have round wheels 36, 50 and 64. The NUMBER OF THE WHEEL used is shown in PURPLE. The number of POINTS in each pattern is shown in GREEN. Whoops! Thanks for pointing that out! I have corrected them. So I have the new set and I have some questions. What the heck is the rack and bar for? HOW do you use them?! And why aren’t my lines as smooth as they should be? The rack: you can stick it to your paper and run wheels around it, just as you can run wheels around the outside of a ring. It creates elongated patterns. The bar is a funny, tricky little thing that creates a unique pattern inside a ring. I started writing a blog post on it but haven’t finished it yet. Better to get used to using the wheels first. And that takes practice, learning to let the wheel guide the pen as much as the pen guides the wheel. Your lines will get smoother with practice. Still can’t figure out the bar. #144 and 150. A reminder for me to make a video about it. Did you ever make that video? My daughter just got a small set for Christmas and it included the bar. She is asking me how to use it. Any helpful tips would be appreciated. Thanks. No, sorry I haven’t. I started one on the oval wheel but haven’t put it together yet. There is a good general intro video made by someone else which I added on a post. See the homepage for that. Thanks again for the reminder. Hello. Just found your site on Spirograph, and find it very interesting. Is there anyway to replace the “missing” wheels (especialy 64), or perhaps use another of the remaining wheels? I would miss being unable to make the triangular shape. Indeed. I don’t know why Kahootz left 64 out of the “Deluxe” set. But it’s in their new Super Spirograph. I don’t know if 3-D printing can manufacture pieces to the precision needed, but that would be awesome. Otherwise, the best you can do is look for an old set on E-bay or somewhere. Thanks. that’s good to know. Hmmm… if the 3D worked, maybe someone could run off a batch and sell them on ebay, I’m sure they would be snatched up fast. Just a thought. It’s on my list of things to do. I haven’t tried it since I was a kid. When I do, I’ll make a video.